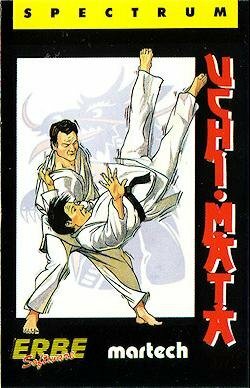 Brian Jacks Uchi Mata (also known as just Uchi Mata) is a Judo fighting game released for various home computers, sold on the name of British Olympic judoka Brian Jacks. It is notable for its control scheme that allowed users to perform various fighting techniques. A similar control scheme would be used a year later in Capcom's arcade game Street Fighter. Another feature that would later appear in Street Fighter was the inclusion of hidden moves: moves that were not included in the instruction manual that players would have to find on their own. Unlike most other martial arts games, the approach is more important than the actual kick/shove/punch etc., since the player must first grab the opponent and subsequently do an up/down/left/right combo (about ten different to chose from) on the joystick before anything happens. The most powerful move is called uchi mata, and if performed correctly it will knock out the opponent no matter how much strength he may have left. A nice little detail here is that the opponent's eyes close/disappear when he lands on his back after a knock out-move. Punching is not allowed, yet there's one available punch in the game, and if executed the player is immediately disqualified. There are 6-7 opponents per level and you can continue play working your way up the "Dan" ratings. This page was last edited on 26 August 2016, at 21:15.